No idea what I'm doing, just kinda jumped into it, electronics supplied to build around, this is what I came up with for a quick knock up. speaker cutouts not in model yet, but rest seems about right, not sure if it should be ported or not yet either. just after some basic input/feedback. Will be built from 18mm MDF. Not really sure what other basics to give since the pic explains alot. Electronics are set in stone since he already bought it all. Cheers all in advance for the feedback. 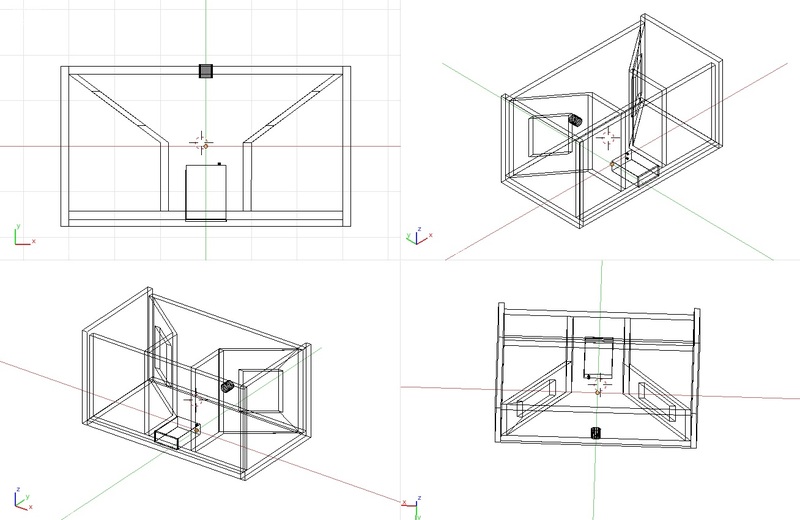 edit: ID of box is L600xH300xW300, OD is 636x336x351. Can give more measurements if needed. Last edited by d3c0y; 15th April 2019 at 12:22 PM. Keeping it simple, car speakers suit sealed enclosures best and are fairly forgiving of cabinet volume. The only other contribution I can make is that the boombox may be rather heavy for portable use if made from 18mm MDF. You may want to experiment with the port, I have found that car speakers sound better closer to open baffle myself. I agree about the weight though, mdf isn’t lightweight/portable! I build portable units on the cheap. I have discovered portable units aren't quite big enough to even try to get the stereo effect so why bother. No sense of trying to combine a stereo source to a mono amp. Stereo amps and stereo sources are plentiful. Keep it simple and use a dual voice coil full range speaker. Now all you only need to worry about is one cone to design an enclosure for, hence saving material and size! 5.25" driver.. 1.5 ft. of area and a simple slot port 1"x4" using 1/2" osb. Lightly stuffed with some fiberglass insulation and you're good to go. Here's one of the drivers I use.. This is a great overall full function amp. Good chip and it doesn't destroy the FM receiver. It will drive the above driver very well.. Consider this type of battery. Much lighter and more Ahr. for the size..
Just a suggestion for a quick, easy portable unit that will amaze.. HAVE FUN!!! "Electronics are set in stone since he already bought it all." "Just a suggestion for a quick, easy portable unit that will amaze.. HAVE FUN!!!" Thank for the feedback guys, yeah it will be heavy, but that's fine and it will likely on occasion be sat on, so the extra bulk probably isn't totally out of line, at least that was my thoughts, but i will have a look at 16mm as the alternative. Any input there by chance? Oh and on the linked amp, have seen and heard 1 with a set of decent bookshelf speakers before, it does sound decent for the price. ^ Sorry that you think I disrespected your post. I meant for reference to subsequent contributors so as to keep the thread on course. Your suggestion is very valuable to others who wish to design a boombox. N/P Galu and I agree. Sometimes I get carried away with my "Food for Thought" intentions. My super frugal mindset doesn't help either.. I'm having trouble trying to understand the OP's enclosure design. (Approx. 12"x24"?) I've used 4" coaxial car speakers with good results. They need some room to produce bass and a port to let them breath. Are the square cut outs intended to be internal ports?